So, as I mentioned in the previous post, I got a needle felting kit. Included in the kit was cookie cutter in the shape of a butterfly, two felting needles, a block of foam, and instructions. I also got to choose three small bags of roving to felt with. The price was only $11.00, and I figured that was a good deal to start a new craft. I got home after the festival, and dug right into the kit. The directions were clear and succinct, and very clear to mention that felting needles are pointy and sharp. I started to make a butterfly, as you can see here. It turned out kinda nice. I’m pleased with it. Why did I pick up needle felting? 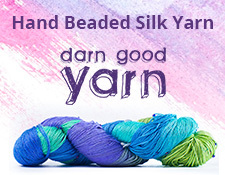 It’s an excellent way to embellish knitting projects, especially felted ones. There were some beautifully knitted then felted projects at this booth that had needle felting embellishments. Soon, I’ll experiment with felting/needle felting again with the ugly Paton’s Wool yarn I just bought. 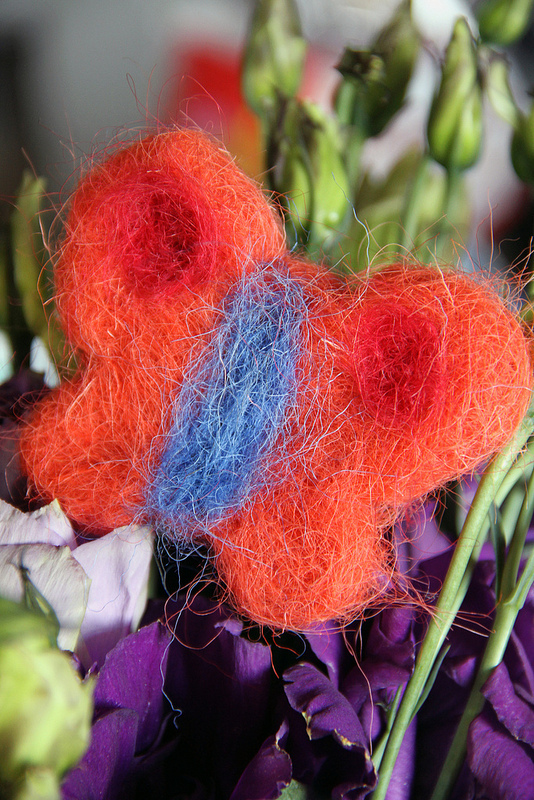 (When it comes to felting your knitting, the uglier the yarn, the cooler the felted result). I also want to try 3-D needle felting, that is, making little figures, animals, people, etc. That’s down the road, but first I’m going to decorate my knitting with felted patterns. I’ll definitely share my results with you. Check The Wool Garden and their Karakul sheep. They were the fine trio of women whom I bought the needle felting kit from.